Perhaps the strangest of all the pet deaths would be the cat Scooter whose body was found intact at 1.00am on the street in a very quiet neighbourhood. A neighbour had apparently recognised Scooter and went to get a blanket to cover her body but when he returned she had disappeared. 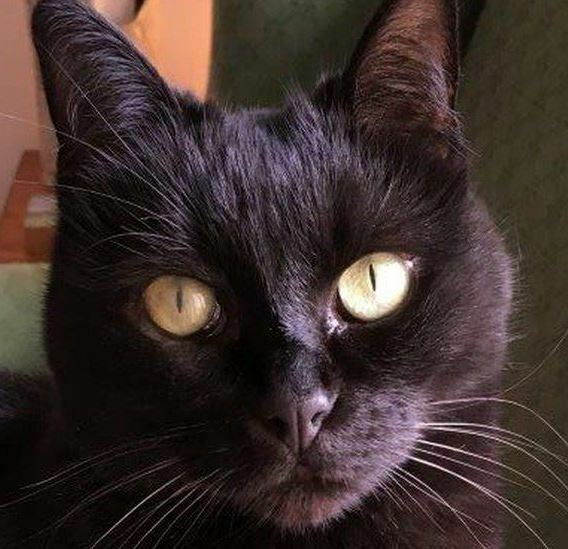 Scooter was then found by another neighbour four hours later mutilated in a typical bloodless Croydon Cat killer fashion. Scooter's death has been officially connected to the UK Animal Killer who is operating a gruesome regime of death in south London and can be read here..
We are left with questions. What originally killed Scooter when she was found on the street? What collected Scooter in the few moments it took to get a blanket? Where was Scooter when she was being dissected? Who took Scooter to the neighbour's yard in the early hours of the morning and laid her body out as if she was stretching, except her tail had been removed with a clean cut and she had been sliced open from head to abdomen, her entrails pulled out and laid beside her on the grass? SNARL says that all cats relating to the UK Animal Killer are killed by blunt force trauma, followed by a 30 minute leeway to stop the blood circulating after which they are mutilated. Was Scooter in the 30 minute leeway when she was found? If there is never blood found at the crime scenes where does the dissecting take place? What happens to all that blood? Evil is a supernatural crime too horrible to contemplate and authorities will always refuse to admit to anything that doesn't fit logic. "Having worked on this case for a year now I have an increased interest in animal abuse/mutilations anywhere. I do agree that there are a number of cases that defy explanation and as I said before I have an open mind on the issue of alien lifeforms." Are all the poor little victims claimed by owners? Is the killer actually killing local cats to that area or is he/she/them placing unknown cats? seems strange if he/she/them takes cat away to murder then remembers where he/she/them the poor puss was from to place it back there. It does seem strange. Also how no one can see someone wearing a headlamp or carrying a torch hanging around someone's property at night, is also a mystery. You'd have thought in three years that someone would have seen something by now. Oh yes and he breaks into people’s gardens to wait for cats? How the hell does he know where to find them and when exactly They will turn up? what happens if he’s in someone’s garden and he doesn’t see one? How has he got to enter and leave a property with a flashing light and make no sound and leave no DNA from his clothes, without being seen or heard most nights of the week over the past three years? It’s impossible. It can’t be done. The torch would give him away with the moving light. Visibility at night is very poor, especially when the weathers bad. I can’t believe he’s been entering all these strange gardens over the last three years and not fallen over something or left some fibres or scent from himself behind. Especially in poor light and weather conditions. Also how the hell has he managed to catch a deer, birds and squirrels? One movement from a human and cats are gone. So how does he manage to do this? You know how fast squirrels are they are impossible to catch. I totally forgot about your winter weather and still the murders are occurring three animals a day with no let up. Too strange. What about that last death in the newspaper about Scooter. Neighbor went to get blanket for intact body at 1am and it was gone when he got back only to be found by another at 530am mutilated elsewhere. Snarl says the murders have been going on since as far back as 2010. I've been following this page sadly for a couple of years now and like you find the whole thing odd in the extreme. My understanding is that on one occasion he placed the heads of fox cubs just out of sight of CCTV in a Tesco's car park and that has indeed, as you say, climbed a fence, apparently opened a rabbit hutch, killed the bunny and closed the hutch again all without being seen or heard. Rabbits scream. How come this one didn't? Unless he chloroforms them but then apparently there's no sign of any drug being used.